Cheese is the chameleon of the food world, as well as one of its greatest delights. Fresh and light or funky and earthy, creamy and melty or crystalline and crumbly—no other food offers such a variety of flavors and textures. But cheese is not just a treat for the palate: its discovery changed the course of Western civilization, and, today, cheese rinds are helping scientists conduct cutting-edge research into microbial ecology. In this episode of Gastropod, we investigate cheese in all stinking glory, from ancient Mesopotamia to medieval France, from the origins of cheese factories and Velveeta to the growing artisanal cheese movement in the U.S. Along the way, we search for the answer to a surprisingly complex question: what is cheese? Join us as we bust cheese myths, solve cheese mysteries, and put together the ultimate cheese plate. This is the story you'll often hear about how humans discovered cheese: one hot day nine thousand years ago, a nomad was on his travels, and brought along some milk in an animal stomach—a sort of proto-thermos—to have something to drink at the end of the day. But when he arrived, he discovered that the rennet in the stomach lining had curdled the milk, creating the first cheese. But there’s a major problem with that story, as University of Vermont cheese scientist and historian Paul Kindstedt told Gastropod: the nomads living in the Fertile Crescent of the Middle East in 7000 B.C. would have been lactose-intolerant. A nomad on the road wouldn't have wanted to drink milk; it would have left him in severe gastro-intestinal distress. Kindstedt, author of the book Cheese and Culture, explained that about a thousand years before traces of cheese-making show up in the archaeological record, humans began growing crops. Those early fields of wheat and other grains attracted local wild sheep and goats, which provide milk for their young. Human babies are also perfectly adapted for milk. Early humans quickly made the connection and began dairying—but for the first thousand years, toddlers and babies were the only ones consuming the milk. Human adults were uniformly lactose-intolerant, says Kindstedt. What's more, he told us that “we know from some exciting archaeo-genetic and genomic modeling that the capacity to tolerate lactose into adulthood didn’t develop until about 5500 BC”—which is at least a thousand years after the development of cheese. In the warm environment of the Fertile Crescent region, Kinstedt explained, any milk not used immediately and instead left to stand in those newly invented containers "would have very quickly, in a matter of hours, coagulated [due to the heat and the natural lactic acid bacteria in the milk]. And at some point, probably some adventurous adult tried some of the solid material and found that they could tolerate it a lot more of it than they could milk.” That's because about 80 percent of the lactose drains off with the whey, leaving a digestible and, likely, rather delicious fresh cheese. So, the next time you're eating a ricotta lasagne or cheesecake, just think: you're tasting something very similar to the cheese that gave ancient humans a dietary edge, nearly 9,000 years ago. Those early cheese-making peoples spread to Europe, but it wasn't until the Middle Ages that the wild diversity of cheeses we see today started to emerge. In the episode, we trace the emergence of Swiss cheese and French bloomy rind cheeses, like Brie. 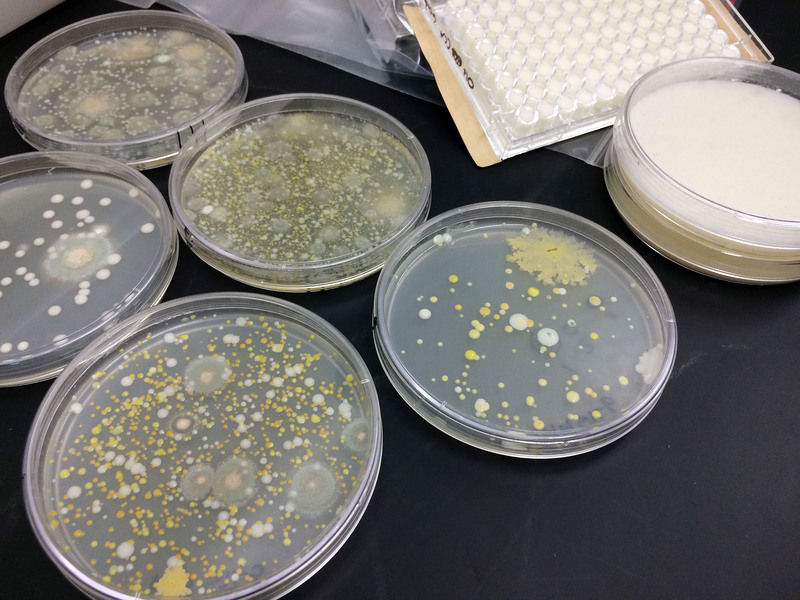 But here's a curious fact that didn't make it into the show: when Gastropod visited Tufts microbiologist Benjamin Wolfe in his cheese lab, he showed us a petri dish in which he was culturing the microbe used to make Camembert, Penicillium camemberti. And it was a gorgeous blue-green color. In his book, Boisard attributes the rapid rise of the white mutant to human selection, arguing that Louis Pasteur's discoveries in germ theory at the start of the twentieth-century led to a prejudice against the original "moldy"-looking green Camembert rinds, and a preference for the more hygienic-seeming pure white ones. Camembert's green origins have since been almost entirely forgotten, even by the most traditional cheese-makers. 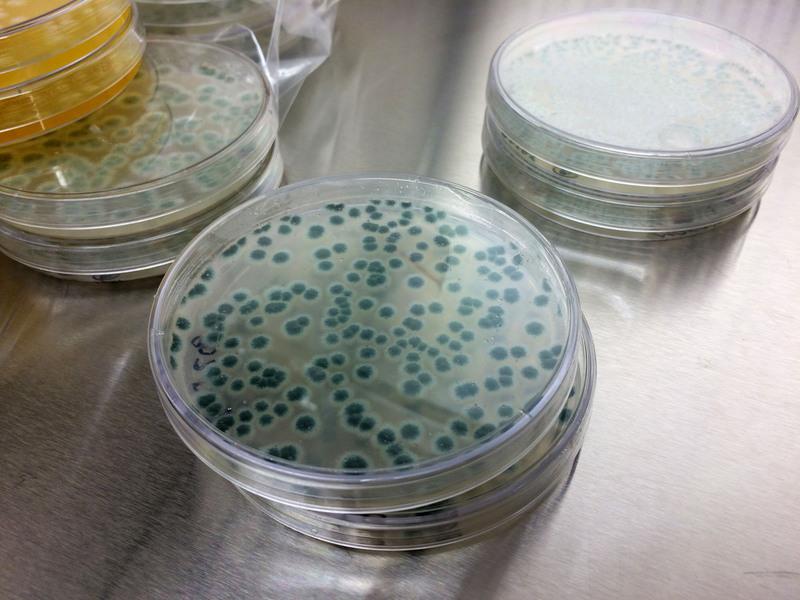 Penicillium camemberti growing in a petri dish in Ben Wolfe's lab. Photograph by Nicola Twilley. Listen to this week’s episode of Gastropod for much more on the secret history and science of cheese, including how early cheese bureaucracy led to the development of writing, what studying microbes in cheese rinds can tell us about microbial ecology in our guts, and why in the world American cheese is dyed orange. (Hint: the color was originally seen as a sign of high quality.) Plus, Gastropod will help you put together the world's most interesting cheese plate to wow guests at your next dinner party. Listen here for more! Heather Paxson is a professor of anthropology at MIT, as well as the author of an excellent book, The Life of Cheese, all about the new wave of American artisanal cheese-makers. In the episode, Heather Paxson describes the struggles she and her colleagues went through as part of a committee responsible for writing this American Academy of Microbiology FAQ on microbes and cheese, "Microbes Make the Cheese," published in February 2015 and available as a free PDF here. Paul Kindstedt is a professor in the Department of Nutrition and Food Sciences at the University of Vermont, where he studies the chemistry, biochemistry, structure, and function of cheese. His book, Cheese and Culture: A History of Cheese and its Place in Western Civilization, came out in 2012. 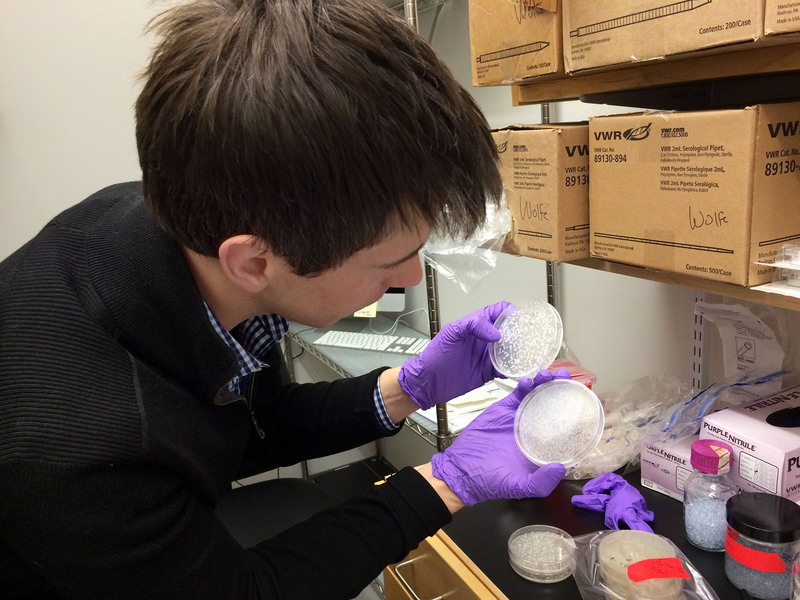 At his lab at Tufts University, microbiologist Benjamin Wolfe studies how microbes from food (mostly cheese!) interact, in order to tease out the ecological and evolutionary forces that shape microbial diversity. He is co-founder of MicrobialFoods.org, an online publication exploring the science of fermented foods. In-vitro cheese rind communities in Ben Wolfe's lab. Photograph by Nicola Twilley. This paper, published in the journal Cell in July 2014, was co-authored by Benjamin Wolfe, Julie E. Button, Marcela Santarelli, and Rachel J. Dutton. 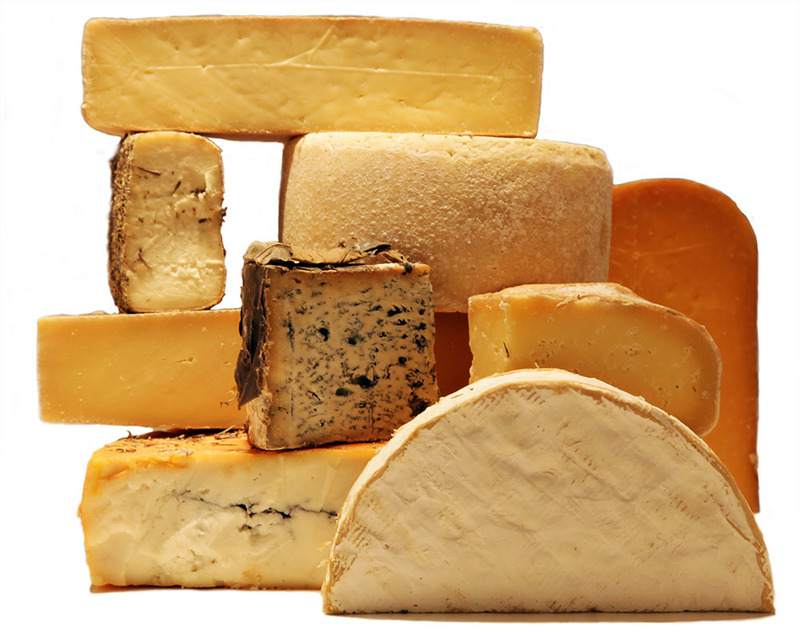 The team surveyed 137 European and North American cheeses to assess microbial diversity, with some fascinating results. At the time, Wolfe was working in Rachel Dutton's lab at Harvard's FAS Center for Systems Biology. A Gastropod listener and current post-doc in Dutton's lab, Kevin Bonham, recently wrote a three-part essay at Scientific American that goes into detail about the process for DNA-sequencing a cheese rind, and how to turn that data into useful information. To eat the rind or not? You may have noticed that some eaters scorn the rinds of cheeses, from the soft fuzzy white carpet that envelops brie to the tougher edge of an aged cheddar, while others tuck right into them. Which approach is correct? The answer depends on what kind of rind it is—as well as your own comfort level with microbes. As we explain in the episode, Ben Wolfe has become something of a "cheese doctor," with cheese-makers sending him their "Frankencheeses" in the mail, in order to figure out what went wrong. Meanwhile, listener "Moldy in Avignon" sent us an email with the subject "Gross Cheese Mystery," and a photograph of really, really old cheeses for sale in the Avignon market. We consulted with Ben, who shared his own photos of brown, nasty-looking French cheeses for sale at the Slow Food Festival in Bra, Italy. Apparently, these kinds of super-aged cheeses are meant for eating, though the cheese seller in this short video explains they are hard to find these days and much less popular than they used to be. 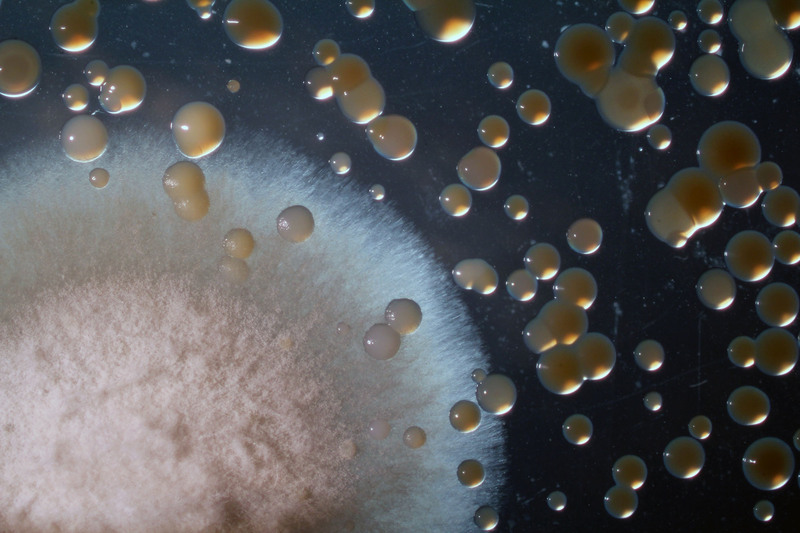 The brown dust is actually microscopic cheese mites: Wolfe calls them the "gophers" of the cheese world, as they eat into the rind, aerating it as well as increasing the surface area available for microbial colonization (and thus flavor development). They're common in cheese aging, although in the U.S. they're usually regarded as a pest, and cheeses are carefully brushed to remove them. Here's footage of a cheese mite munching on microbial hyphae, filmed at the Dutton lab. Very old cheeses (aged for up to five years) covered in craggly molds and a fine dust of cheese mites. (Left) Photographed by Ben Wolfe for sale at the Slow Food Festival in Bra, Italy. (Right) As photographed by listener "Moldy in Avignon." This episode wouldn't have been nearly as much fun without all your cheese stories: thanks to all of you who wrote or called in, and particularly to Elana Lubin, Roz Cummins, Emily Lo Gibson, Mike Simonovich, Jenny Morber, Etta Devine, Tasha from the Boston area, and Doug from Perth. We sampled audio from Alex Crowley's Wallace & Gromit "The Cheesesnatcher" claymation, as well as a 1986 Velveeta ad, a 1958 Kraft ad, and a "Time for Timer" Saturday morning cartoon PSA from the 1970s.